The weather’s cool, the holiday festivities are past, and runners are ready to flex muscles this weekend in two marathons on Okinawa and another on Miyako Island. Sunday sees the 29th Okinawa Commemorative National Government Park Trim Marathon, a variety of timed events of varying distances. The fun begins at 9:45 a.m. at Okinawa Commemorative Government Park, with runners participating against preset finish times. The 3.5 kilometer race is within one hour, the 5.8 kilometer race within 1 1/2 hours, a 9.97 kilometer run within two hours, and the 19.2 kilometer race within three hours. Organizers point out running speed is not a key consideration in the races. Information is available at (098) 048-2741, or at www.okipark.jp/. Northern Okinawa’s Ocean Expo Park is also hosting its Trim Marathon Sunday. The marathon gets under way at 10 a.m. Organizers say the excitement of the Ocean Expo Park event is well worth the two-hour drive to the park, located west of Nago City and Motobu Town. Entry fee is ¥2,000 for adults and ¥1,000 for children. Ocean Expo Park Trim Marathon registration information is available on the web at www.ocean-park.go.jp. 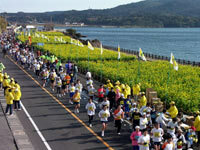 Miyako Island is boasting both a 100-kilometer Wide Marathon on Sunday, and a 100 kilometer ultra long walk on Saturday. The Miyako Island 100k Ultra Long Walk starts Saturday morning from the Miyako Island Tokyu Resort Hotel. Entry fee is ¥15,000. Details are available at (042) 797-5383. The 18th Annual Miyako Island 100k Wide Marathon takes place on Sunday, with three separate distances. Entry fee for the 100k race is ¥15,000, while the 50k marathon is ¥8,000. 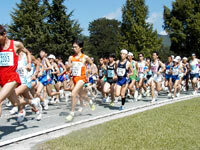 A half marathon, 21 kilometers, will also be run, with entry fee ¥3,000. Registration information is at www.city.miyakojima.lg.jp/site/view/index.jsp, or calling (098) 073-1046. Miyako organizers say there will be a series of festival style events following the races at Ueno German Culture Village. Although not in the race business, Ogimi Village is inviting Okinawa to its Sangyo Festival Saturday and Sunday. The village will be featuring agriculture and maritime products from the village. The festival takes place at Ogimi Village Nason Kankyo Kaizen Center. Ogimi Village is 2 1/2 hours north of Naha City.